New guests are always welcome at Rolling Waves Beach Cottages. We find they soon become old friends. 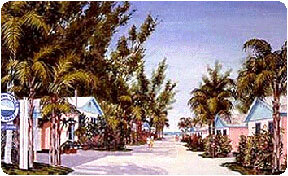 In fact, a few of our regulars recall the Winter of '48, when our tradition began on Longboat Key. Eight sturdy vacation cottages were constructed in a tropical setting as rugged and individual as the patrons they beckoned. The 1920s drawbridge to Lido/St. Armands (with a connection mainland causeway) helped define "getting away from it all." Today, when you visit, you'll find honest comfort in a place of natural beauty. Among vacation retreats we're as individual as you are. Rolling Waves is quaint and classic, a getaway where walks on the beach, boating, shelling, fishing are as important as nearby Sarasota's sophisticated delights.